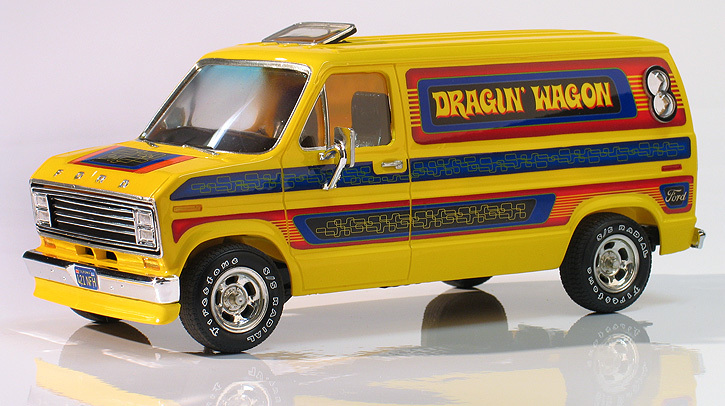 As a kid growing up in the '70's I was influenced by the van craze like many car enthusiasts my age. 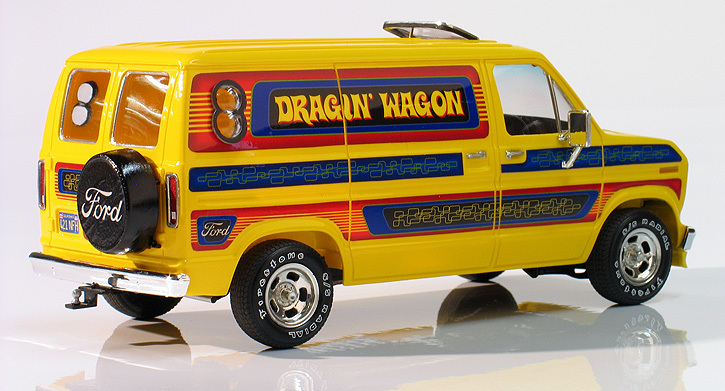 I remember building several custom van models back in my youth including several Ford Econolines. Those models are all long gone now, but I do still have some of their remnants floating around in my junk parts boxes. 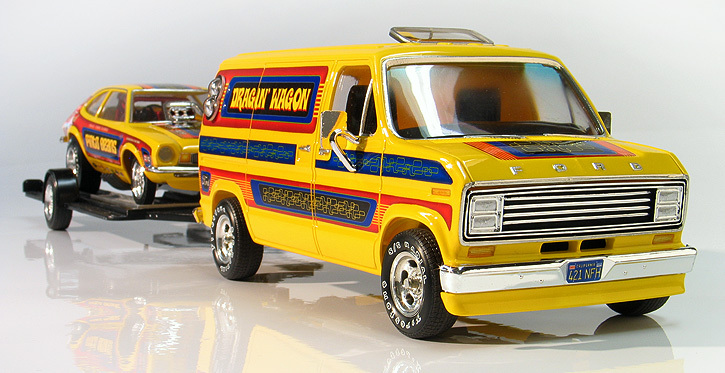 A few years back, I decided to start searching for unbuilt examples of Dodge, Ford and Chevy van kits and stashed them away for later use. 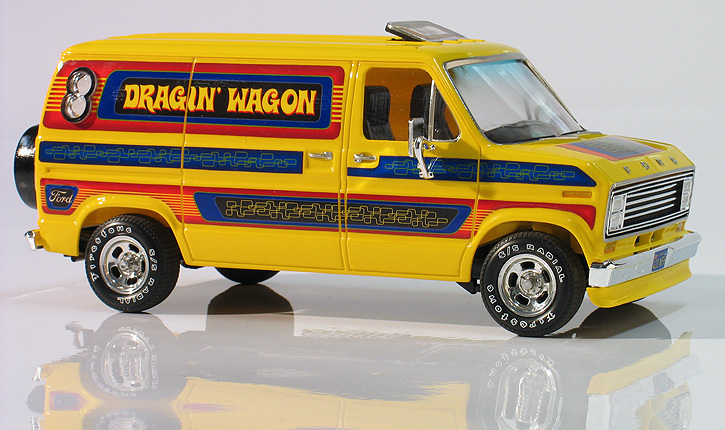 After a couple months of searching on ebay I scored a mint unbuilt AMT1975 Ford Econoline kit. 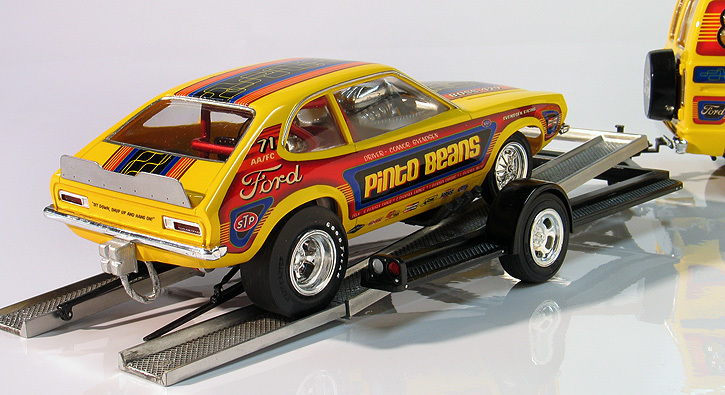 Recently, I built a Pinto funny car model and had a lot of fun making my own custom made inkjet decals for my kit. I was really happy with how the Pinto turned out and I decided to build a companion piece for it. 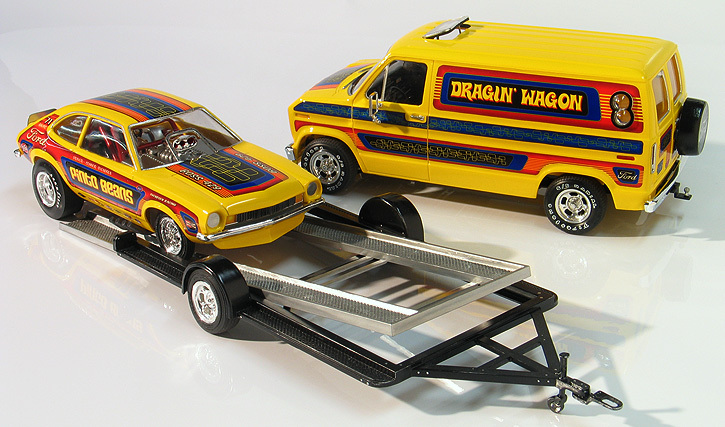 I thought it would be neat to have a matching tow vehicle and trailer for the Pinto, so I dug out my Ford van kit and decided to build it. 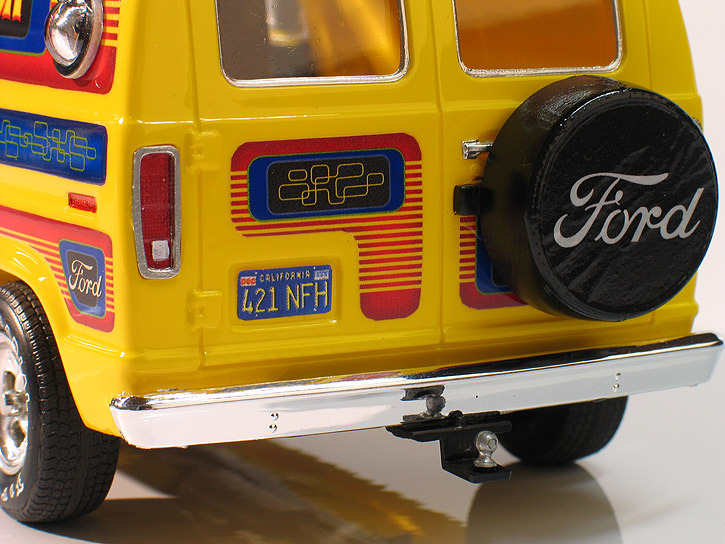 I wanted my Ford Econoline to feature custom parts typical of the area. 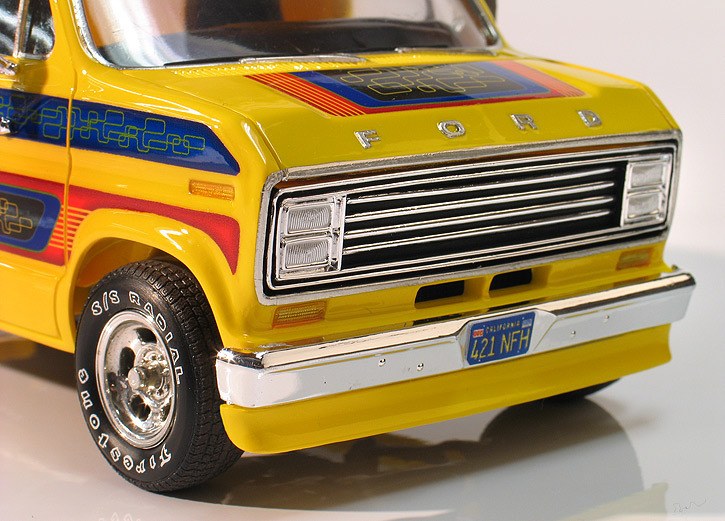 I dug through my junk parts box and found a front spoiler and the custom tube grill with quad headlights from the later "Vantom" issue of this Ford van kit. I also modified the body to accept rear bubble side windows and a sunroof. For wheels I used '70's style 5-slotted mags which I took from the MPC 1976 Dart Sport kit. The tires are Goodyear GT Radials that were available in many Monogram kits during the '80's. I mounted them backwards and then added Firestone SS/Radial white lettering using dry transfers I made from my own custom art. The paint is Tamiya bright yellow shot from a spray can. I designed the custom art work for it using Illustrator CS3 on my Mac and then printed water slide decals from my inkjet printer. After the decals were applied and BareMetal foil was added the whole body was shot with PPG urethane clear. 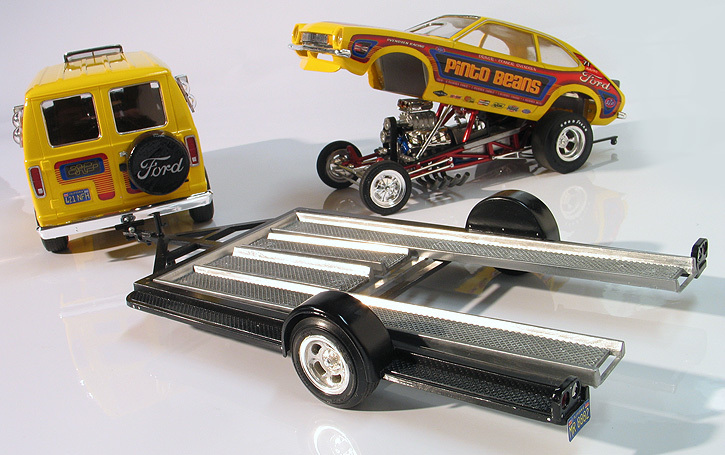 The single axle tilt-back trailer was built using the parts available in the MPC 1976 Caprice kit. 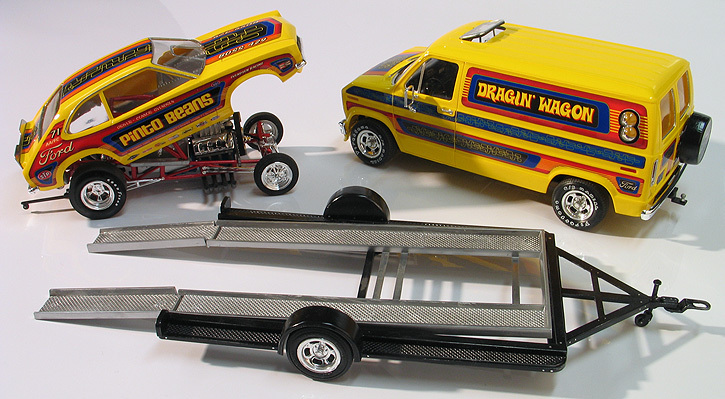 It was built straight from the box with the exception of swapping the wheels out to match the van. I wanted the trailer to look slightly used, so I added some subtle weathering with some pastel chalks and dirty washes. I intentionally gave it a generic look so that I could swap out the wheels and display it with other projects if I desired.